The trouble with being a child is that you aren't really in control of the important things, and everyone likes to think they are in control of the things that matter. Take Gemma and Alice. They're best friends. They've been best friends ever since they were born on the same day in the same hospital. They went to the same nursery school, and the same infant school, and now they're together in the juniors. Gemma is the noisy, wild one. Alice is the quiet one with the long blonde hair. I took a deep breath, as if I was about to blow out all the candles on my birthday cake all by myself for the first time. 'IT'S ALL YOUR FAULT!' I shouted. Auntie Karen jumped. Alice gasped. Mum shot up and seized me by the shoulders. The thing is, it makes no difference how hard the girls cry, or how loudly they complain, Alice is going to move away, and nothing will bring her back again. So Gemma is going to have to face up to the fact that Alice will make new friends in Scotland. 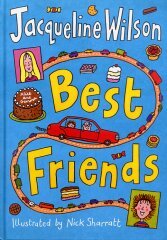 And Gemma will need to give in and find herself a new friend at school, because life does go on. But, as Gemma and Alice discover, even if they do make new friends, there's no need to forget everything that they've shared together in the past. Sad but happy. Read it. I'm sure you'll love it!